The Dutch Participation Society Needs Open Data, but What is Meant by Open? Open data and citizen-led initiatives can be both friends and foes. Where it is available and ‘open', official data not only encourages increased public participation but can also generate the production and scrutiny of new material, potentially of benefit to the original provider and others, official or otherwise. In this way, official open data can be seen to improve democracy or, more accurately, the so-called ‘participative democracy'. On the other hand, the public is not always eager to share their personal information in the most open ways. Private and sometimes sensitive information however is required to initiate projects of societal benefit in difficult times. 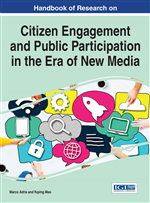 Many citizens appear content to channel personal information exchange via social media instead of putting it on public web sites. The perceived benefits from sharing and complete openness do not outweigh any disadvantages or fear of regulation. This is caused by various sources of contingency, such as the different appeals on citizens, construed in discourses on the participation society and the representative democracy, calling for social openness in the first and privacy protection in the latter. Moreover, the discourse on open data is an economic argument fighting the rules of privacy instead of the promotion of open data as one of the prerequisites for social action. Civil servants acknowledge that access to open data via all sorts of apps could contribute to the mushrooming of public initiatives, but are reluctant to release person-related sensitive information. The authors will describe and discuss this dilemma in the context of some recent case studies from the Netherlands concerning governmental programmes on open data and citizens' initiatives, to highlight both the governance constraints and uncertainties as well as citizens' concerns on data access and data sharing. It will be shown that openness has a different meaning and understanding in the participation society and representative democracy: i.e. the tension surrounding the sharing of private social information versus transparency. Looking from both sides at openness reveals double contingency: understanding and intentions on this openness invokes mutual enforcing uncertainties. This double contingency hampers citizens' eagerness to participate. The paper will conclude with a practical recommendation for improving data governance. It is believed by many that the participation society thrives by opening up big data and deploying E-governance, because it enables new sorts of communication, organisation without organisations, mobilisation etc. (Brunsting & Postmes, 2002; Foth, Forlano, Satchell, & Gibbs, 2011; Shirky, 2008). A recent Open Access and Creative Commons movement enables citizens to gain access to public goods like scientific and other forms of data, that can then be used for further action (Schiltz, Verschraegen, & Magnolo, 2005). Crowdsourcing data can result in citizens science under the condition of ownership and citizens control (Hafen, Kossmann, & Brand, 2014). In the Dutch situation citizens’ initiatives are mostly reviewed from the governance perspective, based on evaluations of participation projects that have been initiated by governmental actors (Bakker, Denters, Oude Vrielink, & Klok, 2012; Newman & Tonkens, 2011; Tonkens & Verhoeven, 2010; Verhoeven, 2009). This reduces criticism but encourages a bias towards a management perspective on issues of what is supposed to be good citizenship. The often made statements that citizens and local government seek interaction cannot be questioned if researchers only research government or civil society inspired initiatives, such as problematic neighbourhoods (Bakker et al., 2012; Tonkens & Verhoeven, 2010; Verhoeven, 2009). It is suggested this governance bias can only be overcome by critical systemic analyses of the surge in participative behaviour across all aspects of the representative democracy and the participation society. Increasingly,active citizens are recognised as good citizens. The distinction between good and bad however, is not as straightforward as one would expect (R. Van Dam, Duineveld, & During, 2014). Some active citizens helping the community are convicted for social security fraud, whilst other receive subsidies for exactly similar activities in another municipality, as will be shown in this chapter. The same government that opens anonymous fraud lines for the public to snitch on fellow citizens who are suspected to work for others (in the black economy), praises the active citizen who is setting up an enterprising initiative in the informal economy (Timm Knudsen, Refslund Christensen, & Blenker, 2014). The boundaries between black and informal, or good and bad behaviour in the so called participation society, or should one say appropriate and inappropriate, are sometimes indiscernible. On the other hand Twitter is alive with publically-voiced opinions on the relative merits or otherwise of good and bad policies and politicians (Ausserhofer & Maireder, 2013). But here too, there is contingency. Good politicians are keen on supporting self-management and self-responsibility that are the new cornerstones of the big society. Yet, should they fail or struggle, they are often blamed and shamed for irresponsible behaviour. This simplified sketch of the first steps towards the big society reveals the fuzzy interplay of old and new discourses on citizenship and democracy, with various appeals on open data. We discuss this support for open data against the background of changing ideas on citizenship. The distinction between work and volunteering, clearly defined in the welfare state, has become fuzzy. This fuzziness creates mistrust and mistrust affects the attitude towards openness. This issue of openness in open data and in an open society needs more reflection, to grasp both the theoretical and practical implications of the turn towards the participation society. The question is what ideas of openness prevail in the representative democracy, and how valid they are when strong appeals on active citizenship are communicated? Moreover an underlying issue here is under what conditions can “open data” be beneficial for citizens’ initiatives. It will be interesting to explore discursive conditions, because discourses on good citizenship, participation, open data, civic and community action, on fraud and on privacy shape the environment wherein data will or will not be shared, or citizens will be or not be motivated.